The majority of violent crime is perpetrated by men. The overwhelming majority, when it comes to violent crime done by/to strangers. For once common knowledge is fully supported by all independent data. The human population is 50/50 male female. Men are stopped, detained, arrested, and convicted far more often than women are - arrested 3 times as often for assault, and almost 9 times as often for robbery and murder. This, despite the fact that they make up only half the population. Yet no one is claiming the cops are showing a bias based on gender. We can all comfortably admit that the reason for the discrepancy is that men are actually committing more crime. We also all understand, without even having to say it, that acknowledging this difference is crime rate by gender is NOT the same thing as saying "all men are violent" or "all men are criminals". We understand and accept that, on average, men are more violent without thinking it implies that any specific particular man is violent. I was reading yet another article about how cops are unfairly targeting and profiling Black people, when I came across something unusual: the author had chosen a graphic which actually showed the larger context of the data they were focused on, which completely undermined their own point. hey, look how disproportionately Blacks get shot at by cops!! But this chart also shows some other relevant stats that put everything into context. About 70% of shooting suspects are Black. About 70% of those shooting at cops are Black. Only 50% of those shot at, and 40% of those hit by, cops are Black. 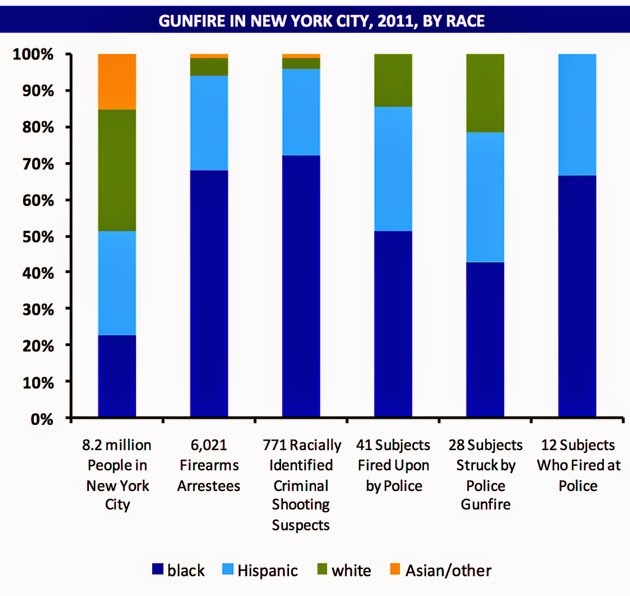 If anything, this data shows a bias against whites, who make up less than 5% of those carrying concealed handguns and shooting at people, yet make up 20% of those shot at by cops. The first thing most liberals will say when presented this data is that the only reason more Blacks are caught with guns is because cops are targeting them. So, perhaps cops have a racial bias where by when they catch a white teenager smoking pot or shoplifting they look the other way, or let the kid off with a warning. They think "aww, he's a good kid, just made a mistake, I don't want to ruin his life by giving him a record". Whereas, if the kid is Black, they are gonna come down on him hard. Funny thing... if cops focus more attention in poor, high crime neighborhoods, then they are "targeting" those people. But if they focus more attention in middle class, whiter, neighborhoods, then they are ignoring victims of color. The reality is that cops mostly focus on where ever there is the most violent crime. As they should. Since the majority of crime is enacted on someone of the same race as the assailant, by targeting Black suspects they are also protecting Black victims. But maybe crime really isn't higher in Black neighborhoods at all, maybe it just looks that way because of bias? Except, in order for that line of reasoning to work, we have to pretend that overall crime rates aren't higher in Black dominated neighborhoods than white ones. If you don't trust government statistics, then go spend some time in different neighborhoods in your own city, and get some anecdotal evidence. In order to be consistent, it would also mean that cops routinely look the other way when white people commit murder. "aww, this [white] guy may have just murdered a woman, but he's probably a good guy, I'm gonna let this one slide". Either that, or there is some elaborate multi-agency conspiracy to cover up all the murders done by white people, (or create fictional murders by Black people), just to trick the public into thinking Black people commit more violent crime. Both of those explanations are silly. The only remaining conclusion is that on average, overall, Black people commit murder about 7 times more often than white people do. Given that, it seems pretty reasonable to think that maybe the differences in rates of being caught for carrying guns might actually reflect differences in the rate of carrying guns. Which means that the chart from the beginning is showing a bias of giving Black people the benefit of the doubt disproportionately. And still everyone is enraged. About 400 people a year get shot by cops nationwide. About 11,000 people are murdered by civilians annually in the US. But wait... of that 400, the vast majority were armed criminals. It happens once every few years. Self-defense is not counted among homicide stats, which means all 11,000 murder victims were innocent. So the actual ratio of innocent people being killed by cops versus civilians is around 1 to 20,000. Of those 11,000 murders, exactly 0 percent of them spark riots, or protest rallies, or national news coverage, or hundreds of blogs. Not unless either the suspect or victim was already a celebrity will anyone hear about it at all. And this difference sends a clear message to murders: its totally ok to kill people, as long as you aren't a cop. The attention we give to Ferguson says "we don't actually care about Black victims of crime at all - we just like feeling outraged and rebelling against authority figures". Does anyone really believe that the residents of Black neighborhoods would be better off if all the cops left and abandoned them to gangs? I don't think the response is malicious - humans are just not very good at thinking through their feelings. We have a history of oppression! We really do. It has set the stage for conditions today. Therefore anything that seems like it could be a sign of oppression is triggering. Triggered! Angry, outrage, protest, riot. We have to do something about these out of control racists cops!! But it isn't helping. It is doing the opposite. Reactionary actions make things worse. Our outrage perpetuates the cycle. When Black children grow up with this constant narrative of "the cops are out to get you", of course it is going to affect the way they interact with cops once they start getting into normal teenage trouble. Teaching teenagers to hate cops is a great way to get them to escalate minor confrontations with law enforcement, and in turn to give cops one bad experience after another with a particular demographic. In other words, our obsessive focus on what is in reality a very rare event creates a self-fulfilling prophesy. Unarmed Black men are not shot by police very often, but the more we pretend they are, the more likely it is to happen. Or maybe that is secretly the goal all along? I wrote a long comment well thought out comment that took a long time to write & the whole thing got erased when I tried to change how I signed it! Now I have to go to bed. How come you can only use google account to sign out. I have a yahoo account. Why can't I use that? There are several options, not just Google: LiveJournal, WordPress, TypePad, AIM (AOL messenger), OpenID, and of course, "type your own name". The reason Google is the default is that Google owns Blogger, the site I use to host my blog for free. I use a copy-paste program called Clipboard Recorder that I highly recommend. It keeps a running list of the last 100 things you copy (as in cntrl+C) or cut (cntrl+X) that you can access later. basically, your begged question that what people are mad about is only the rates at which black people are arrested or whatnot is false. why is one group which makes up only 20% of the population so consistently entered into the judicial system? racism. because there is no other ultimate reason. and no, this is not goalpost moving, although i realise it could look like that. your contention that people are only focused on ONE aspect of the criminal/judicial/prison system is a result of your own cherrypicking, and does not reflect what activist groups actually focus on. perhaps this particular part of the argument annoys you, and so you are very aware of it. fair enough. but stop treating the system as being so simple and completely lacking in wider context. also, check out Stand Your Ground laws, which have been shown to be racially disproportionately enforced. we cannot fix individual parts of the system. we have to fix the entire thing. I can't tell what you are talking about. Why is one group which makes up only 20% of the population so consistently entered into the judicial system? I answered that question in this post. Because one group commits a disproportionate amount of crime. I don't understand the distinction you are making between "arrested" and "entered into the judicial system". Arrest is the first step in that process. Are you talking about convictions, or sentencing rates? Yes, on those counts there IS statistical evidence of actual racism. Although, it is juries - bade up of random ordinary citizens - that decide on convictions. IE a reflection of internal racism throughout the population, not something systemic or based on anything the government can change. I claim that people are most focused on police because that's where most of the focus is! There may be specific activist groups working on jury perception or sentencing discrepancies, but it is police interactions that get people into the streets, and get dozens of editorials written. No offense, but the general public has little awareness of, and doesn't really care about "activists" - unless they are jumping on whatever the current bandwagon is. The fervor over King and Grant and Brown were all over police interactions. There have been no equivalent protests over sentencing discrepancies. The whole reason I keep pointing this stuff out is because I see everyone else as treating the system as being simple and completely lacking in wider context. The stuff I'm pointing out - like differing crime rates - IS part of the greater context, a context that most people prefer to ignore. For example, the Stand Your Ground laws - I have looked into it, and when taking the statistics of assault rates by race into account, there is no disproportionality in its "enforcement". Group A attacks group B about 10-100 times more often than Group B attacks Group A. So when you make it legal to fight back when attacked, group B ends up fighting back against A 10-100 times as often. If you ignore the first half, then it looks like B is the aggressive one, when its the opposite of reality. Stand Your Ground isn't relevant unless someone is attacking someone else first. The way to avoid being a victim of SYG is simple: don't attack anyone. I don't think we can fix the entire thing unless we are honest about the entire problem. Its not all The Man or evil white conservatives out to get us. If we take zero responsibility, none of the solutions are going to solve all the problems. Its more comforting to be angry than to admit fault, but it isn't nearly as helpful in the long run.